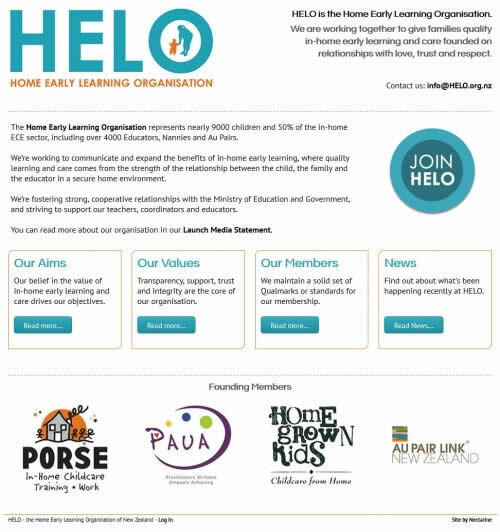 HELO, the Home Early Learning Organisation of New Zealand, represents nearly 9000 children and 50% of the in-home ECE sector, including over 4000 Educators, Nannies and Au Pairs. They needed a site up promptly to describe their organisation, their aims, and call for further members. Nectarine leapt to the task and in a few days they were up and running with a clean, intuitive, SEO-optimised website. It’s also responsive – the layout adapts itself for small screen devices – and the membership form writes to a database that can be exported in a variety of ways to make managing their member list easy.